Arcana, from the Latin arcanus, meaning secret. It was often used in reference to the mysteries of the physical and spiritual worlds. Alchemists were commonly said to be pursuing the arcana of nature. 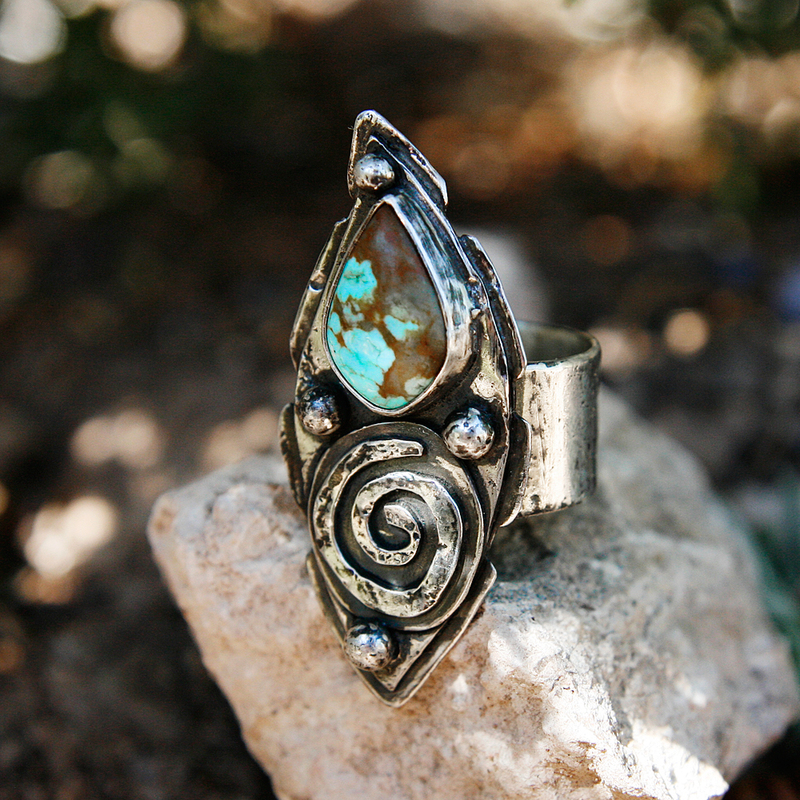 In building this collection of jewelry, gathering the stones to be encased in silver, sketching late into the night symbols and mysteries that swirl around this sacred desert land, ARCANA was born—the pieces are ripe with the secrets and mysteries of nature, our people, our search for meaning, our bone deep ache for true beauty. I hope those who choose to bring these adornments into their lives are met with an undying sense of wonder and beauty upon their path. Layers of symbolism speak to the Seeker in us, those of us looking, always looking for the path with heart. A strong bird of silver will direct you, pointing up towards the great expanse where dreams wait to become real. All points to Source, where our answers lie in wait. 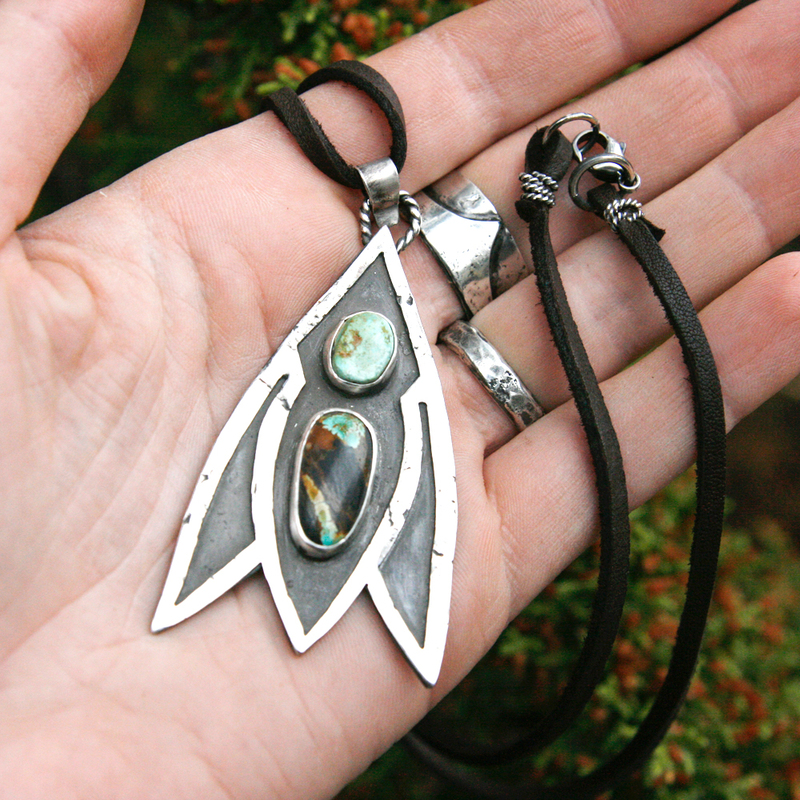 The Raven Talisman, to call in the teachings of Raven King. Ravens are seen throughout lore across the world to be not just symbols of death, but the bringers of light and illumination to the dark places where we may find ourselves. 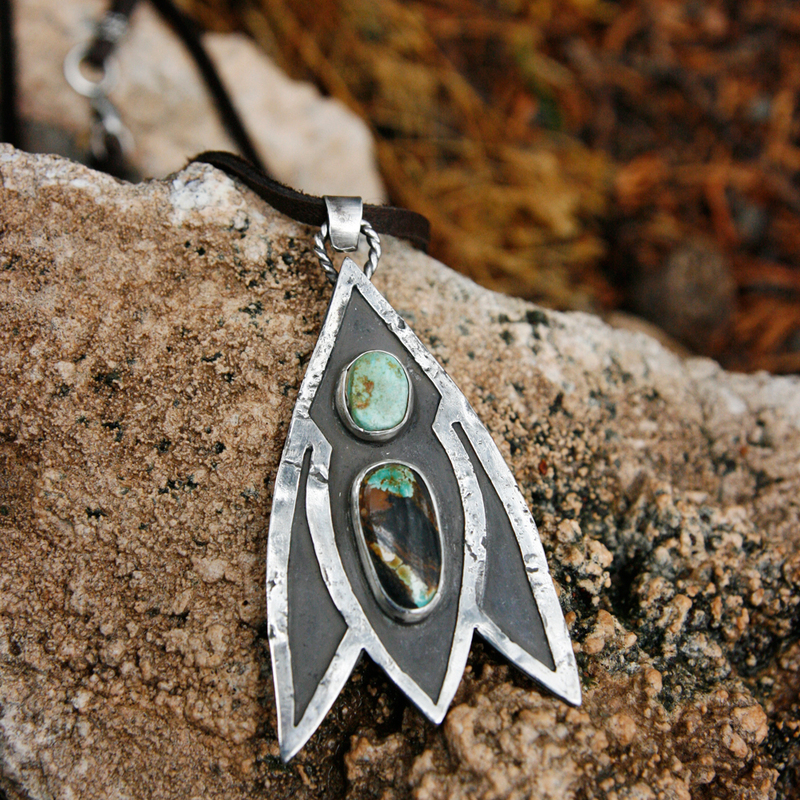 Their wisdom is a lamp to walk alongside us during our journey through the unknown. Our own metaphorical death is not an occurrence to be feared, we can die and be reborn each day with new and wondrous feathers if we choose. Let Raven teach you how to walk in these places without fear, and be guided to the side of Light. 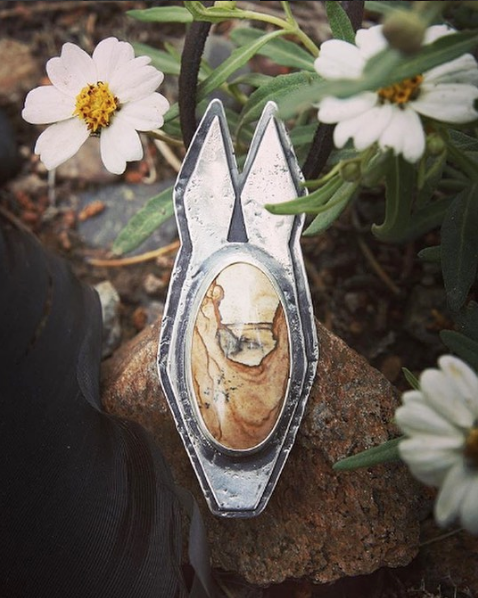 I drew the shape of a raven's skull that I have and then fit stones into it, sawing and hammering the silver onto rock until it looked worn enough to have a thousand stories to tell, like the best wayfarers. 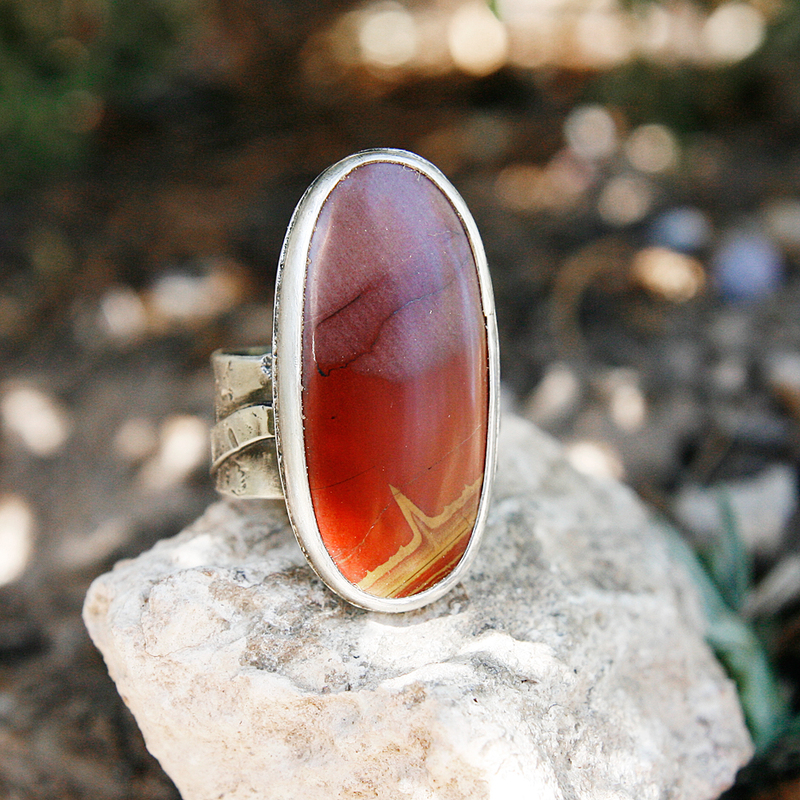 It would look so handsome upon a man's hand. 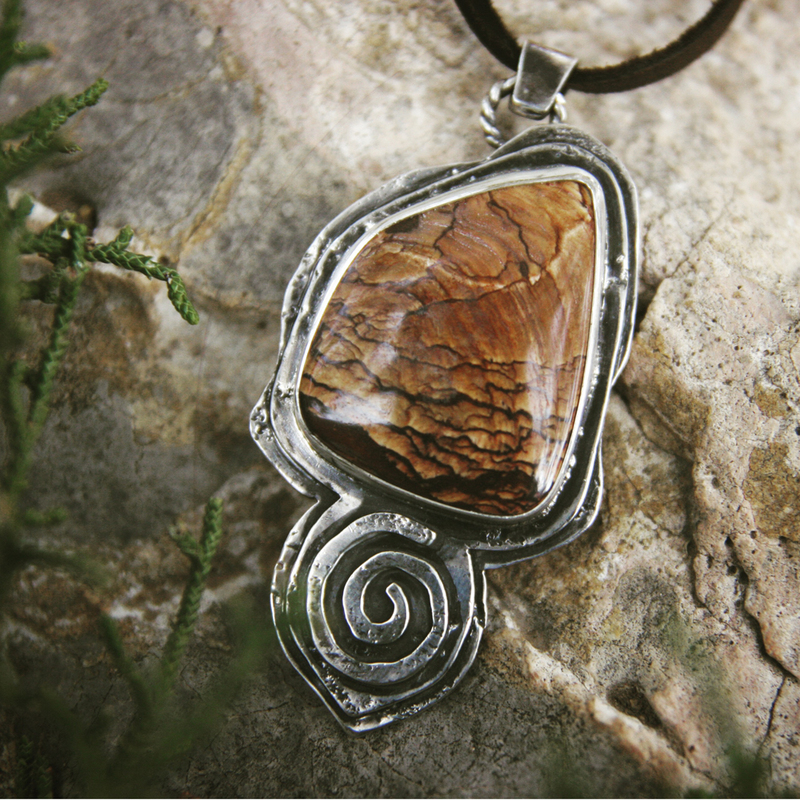 Tiger eye is said to bring together the vibrations of sand and sunlight, synthesizing the energies of the Sun and Earth, combining sharpness and grounding. 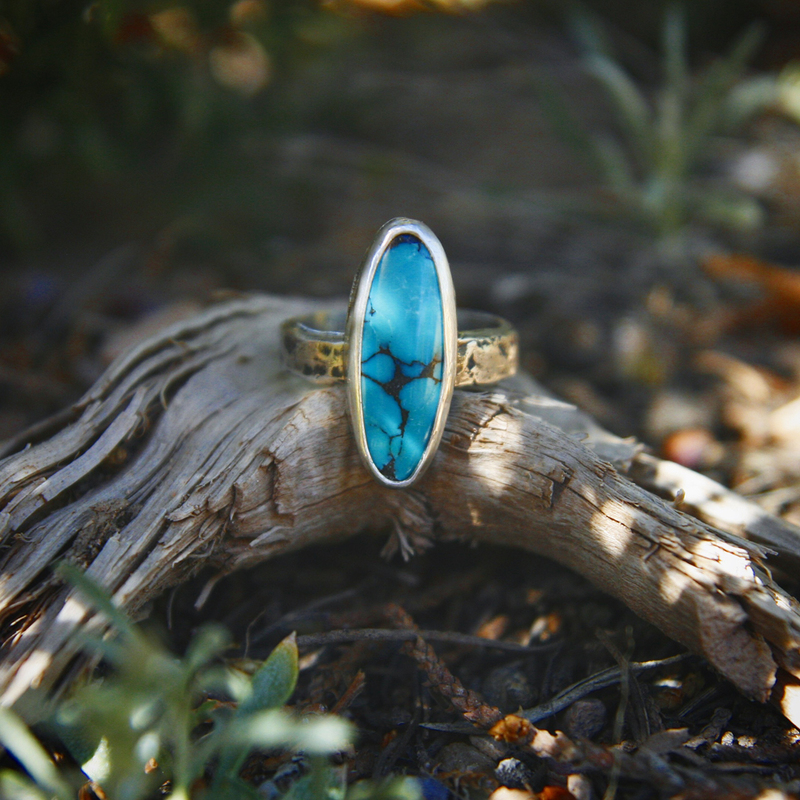 Turquoise brings the blue of Father Sky to the Earth, cleanses the energy centers and the physical body while providing protection. 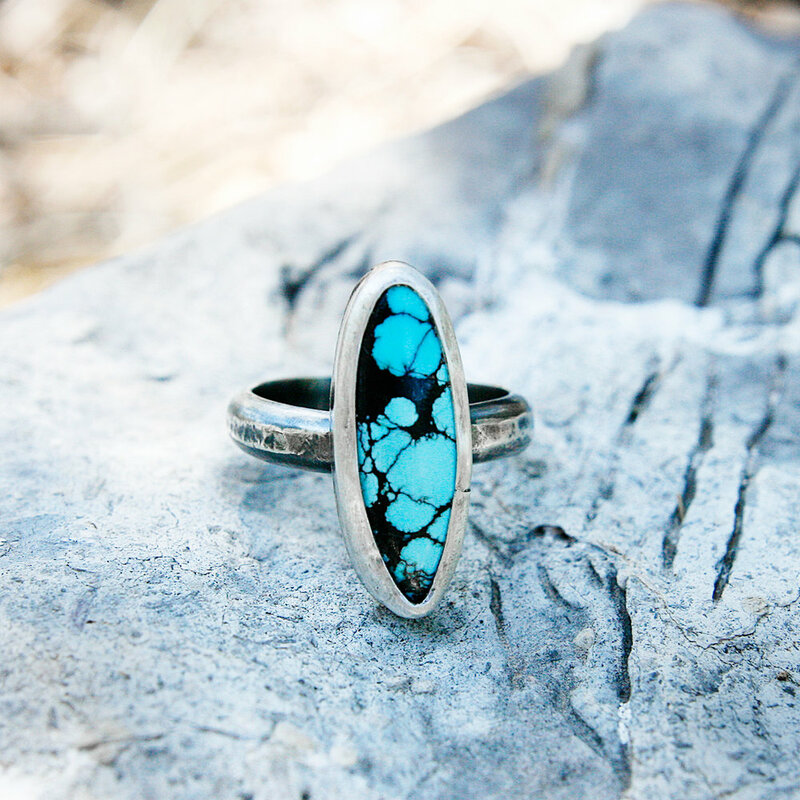 These stones are healers of the Spirit and my hope is for whomever wears this ring to finding any healing they need while on their path. 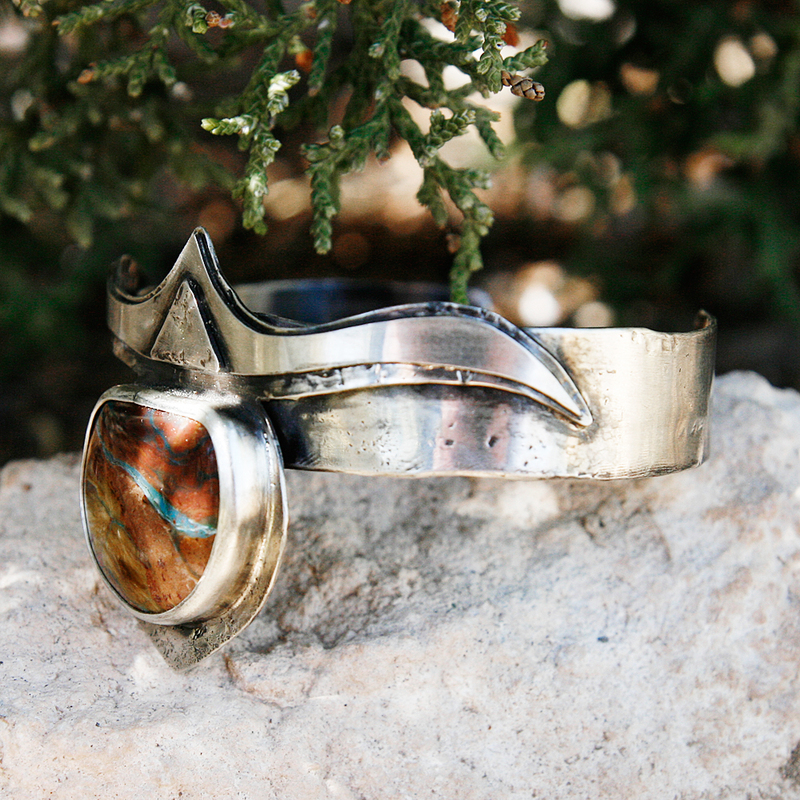 The idea for this design came to me after walking around the land of Chaco Canyon in New Mexico. They, as have many cultures, imprinted this spiral symbol onto rock where it has lasted for over a thousand years. The spiral is said to represent a person's journey inward and outward, to our source, our true selves, our infinite being. This is not a 'new age' idea, it has been around for millennia. I have found that since opening to this symbol and the collective memory of all of our journeys, I have spiraled in deeper to my own. 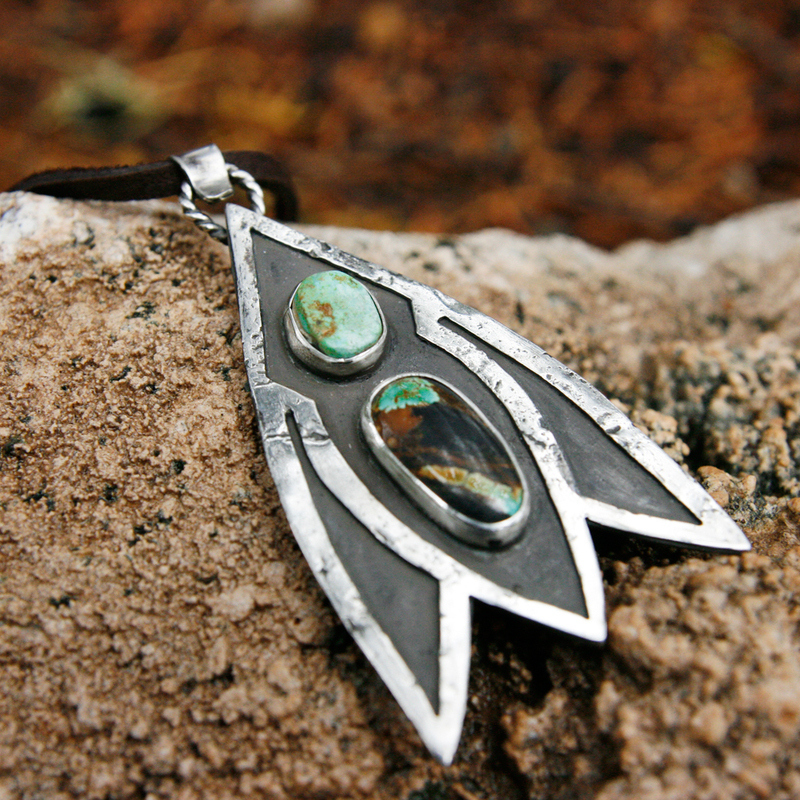 I created this talisman to be your keeper on your own journey, wherever and whenever that may be. The road is beckoning before you. There is so much we can learn from this animal that I cannot fit it all here. What I was feeling most in the creation of this piece is their uncanny ability to fully exist in nearly any environment and climate in which they find themselves. Deserts, cities, forests, dry, wet, hot, cold—they are always there, and they keep their jovial trickster spirit intact. We can learn a lot from this lesson alone, exploring the wisdom found when we embrace the things life heaps at us instead of fighting them. Gentle yet fierce, quiet yet vocal, soft yet hardy, Coyote teaches us to navigate the places we find ourselves with grace and laughter. 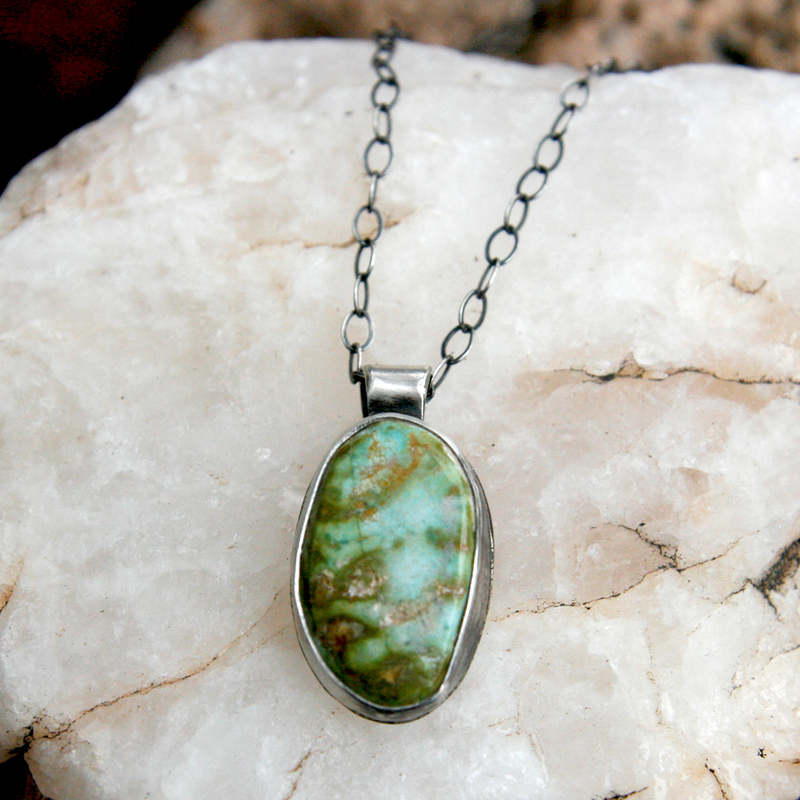 A stone of Jasper echoes the arroyos and canyons where I walk and often hear the Laughing Dog. I come across their dens that are usually dug into a hillside with views of the valleys ahead.